Combing you say? Oh goodness yes. As with apparently all of my fiber tools, purchased used and in excellent condition. Craftsmith no longer makes these combs, a shame since they are really nice and don't have super dangerous sharp tips. 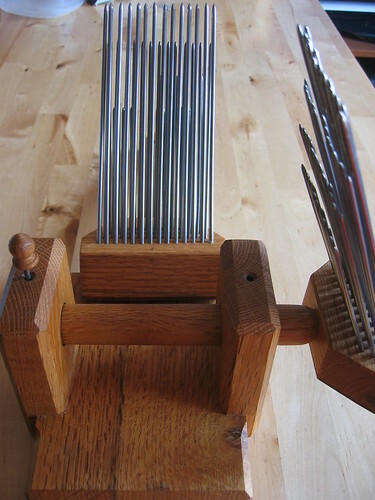 The tines and rows (pitch) are closely spaced for finer fibers*, which is perfect for me and my bias for them... like the superfine Corriedale from Whitefish Bay Farm. The WFB fleeces are all covered, so this was super clean for the most part. Being a lamb meant she wasn't covered right away, so there was probably more gunk and farm refuse embedded in the tips of her fleece than an older sheep would have, but I was able to pull apart and remove matting with my hands (and later my flick carder) prior to washing with no problem. ...the little curls she was born with that are different than the fleece she grew later on. Again on Ravelry I was warned that these lamb tips may snap and break when carding since they were fragile (true), but I had every intention of carding the fleece anyway. Even so, I separated the locks and kept their structure thru scouring, something I find really soothing to do. 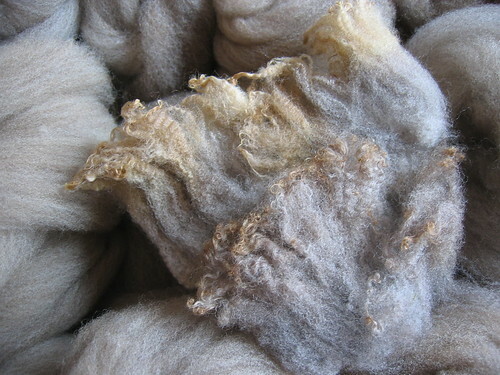 I had been washing this fleece up half a pound to a pound at a time, leisurely since I was really getting steam on carding the cormo at the same time. By the time my new-to-me combs arrived, I had a big bag of washed locks just perfect for the task. (even though I promised myself to wait and get more carding done instead!) A really, really big bag. 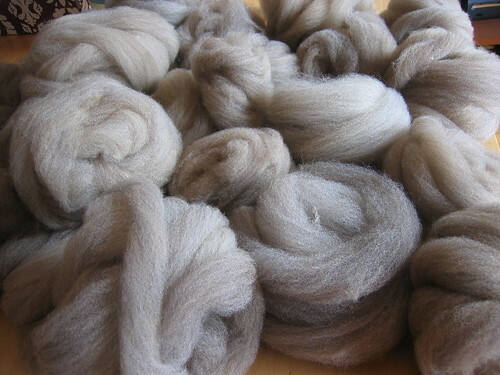 I was really curious to see how this half-taupe, half-grey fleece would look all blended up-- a surprise. The taupe was much more dominant than expected, but the color shifts depending on the time of day (a good thing in my book). I do love combs, and combing though. How much? It doesn't look like a lot (and it's not! only about 6 oz)... but each nest makes me feel more confident with the process and result. It is hard to come to terms with the amount of waste fiber generated though. 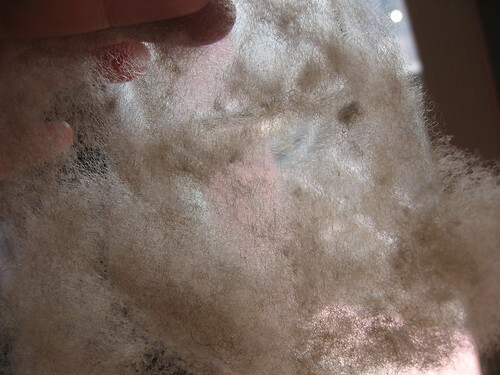 One reason my combs may have been particularly suited to this fleece were the milk tips-- combing helped separate the tips that would be prone to breakage when spinning (and becoming pills). Even so, it's almost hard to look at the "waste" knowing if I had carded it all together, and spun a heavier weight yarn, almost all of the fiber would ahve been useable. Maybe the thing is I don't know what to do with the waste... mulch has been suggested but I don't garden, toy stuffing but I have enough polyfil to last me a thousand toy-making lifetimes. I really, really like the result of the handcombed top, though :) It does make me nervous about the total fiber I'll end up with... Umpqua started as 4.13lbs and clean she washed up to 2.62, a loss of about 35% (same percentage loss I had for the Cormo). Combing though is going to knock that 2 and just over a half pounds down though-- how much? Hopefully not too much so that I can't get a sweater's worth out of it... a true-worsted spun, cable-y sweater from A Fine Fleece :) We'll see! Til then, counting the days! *looking for mini combs for fine fibers/small batches? 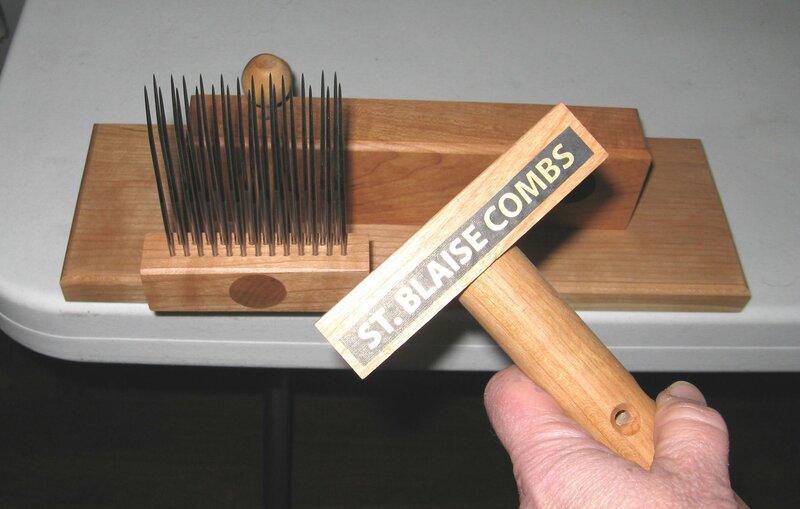 i was going to buy a set of st. blaise combs from Carolina Homespun, and I still may. they aren't listed on CH's site but you can see them here-- they are really, really nice (i was thisclose to buying them at retzlaff, so much in love with them i was.) they're made in the usa, come with handle clamps so you can freehand use them or attach them to a base on a table and almost use them as a hackle, are comparable to the alvin ramer super minis except not *quite* as fine (so they should have more range for more fleece types), are less expensive and in stock at carolina homespun (last time i checked) if you drop them a line. "ARs are 3.5 inches wide and have 19 tines and a tad more than 3 inches long (I am talking about the front row only. Both have two rows of course). The St Bs have 13 tines and are 3 inches wide, but they are almost 3.75 inches long. I have not measured the actual spacing, but the ARs has sixteen tines in three inches to the thirteen in the same distance on the St. Bs. So to summarize, the ARs are slightly finer, shorter and wider than the St. Bs. They would probably hold about the same amount of fiber if you load them about half way." I love corriedale. I think it's my favourite fibre so far... I hope you end up with enough for a sweater, because it will be amazing! 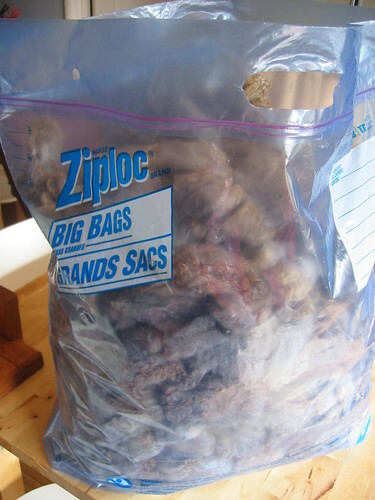 with your waste could you do the thing where you mush a bunch of wet wool flat and felt it. 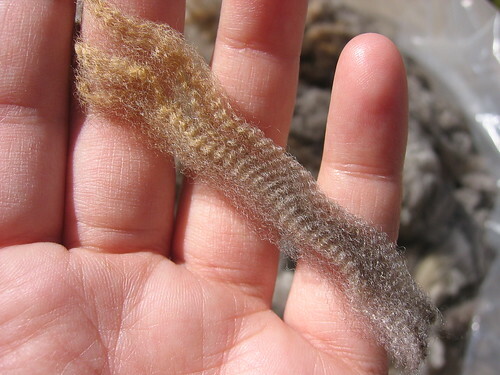 like the actual felting not fulling knitting items? Oh, I am so happy to see that you got one! I love love love them, and if I could never spin any thing other than their Corrie, I could be a happy spinner. It's hard for me to accept the waste fiber too, which is why I always end up carding. But what you ended up with is absolutely beautiful. Thanks for the compliment on my new Obama bracelet! I'm as obsessed with those tiny beads as you are with all that fiber. Sell the leftovers for stuffing on your etsy site! I love the little milk tips . 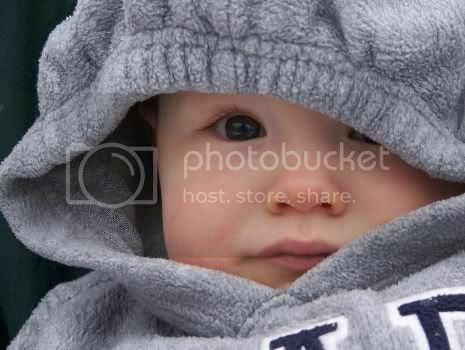 . .
they remind me of the fine baby hairs that curl up on human infants/toddlers/some adults right behind the ears on the neck :). Needle felting or wet felting are great ways to use up little leftover bits of fluff that you can't spin. 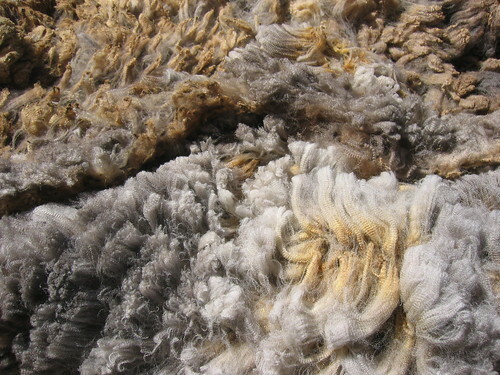 The combed corriedale looks so yummy! I luvs me some fluffy handcombed wool. you could sell it as stuffing on etsy. You could dye it and use it for needle felting. Or you could give it to all the little birdies out there building nests. But it may be a little late in the season for that. Love the crimpy corrie! So delicious! 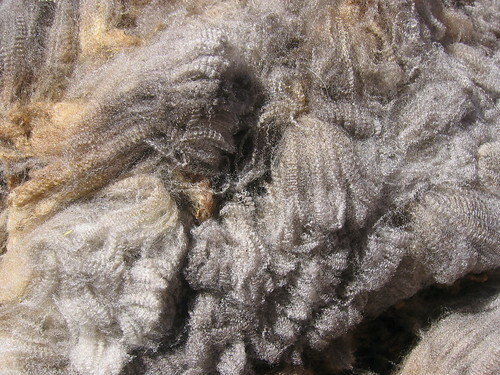 I wish I enjoyed combing fiber more; it is so wonderful to spin. Bravo to you for not trying to keepmore of the waste. It is so hard to watch it pile up. I put out fiber waste in spring for the birds. It can be tucked into hedges or hung in a suet cage (without the suet!). 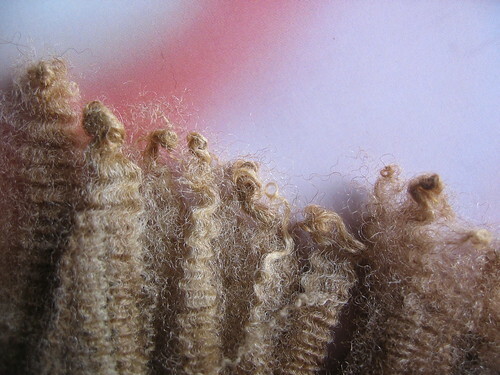 "I think you should dye the neppy fiber in a few different colors, and use it to make a tweedy yarn, a la Crosspatch Creations, or the June SAL on the Spinner Central Ravelry group. 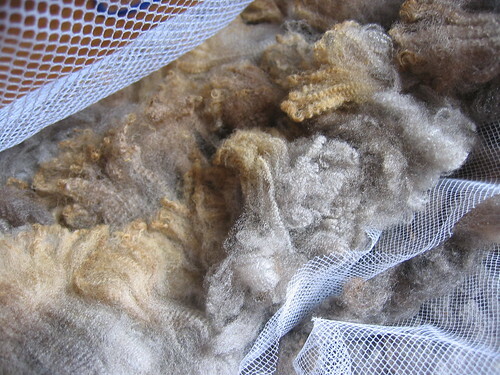 "Alternately, you could use it in an art yarn; I also like the idea of using it as stuffing." Oh, lovely! I love seeing that process! You could use that waste for stuffing into little knitted animals! 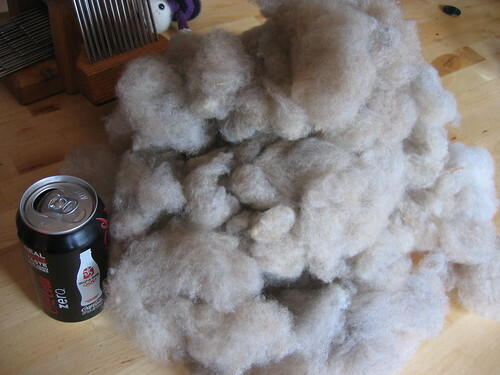 I made some last fall and used dryer lint to stuff them, but I think your waste from combing would be perfect! The waste could be donated to someone with a garden (maybe even one of your readers who would at least offer to pay the shippping costs) Or perhaps someone with a blog you admire would love to try it in their stuffed dolls. 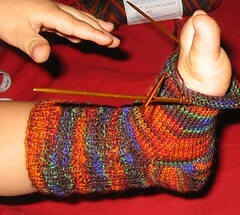 (Yarnstorm's blog, she is always doing crafts that involve stuffing) She is quite a lovely lady. I really enjoy reading your blog and learning about spinning as well as your wonderful knit projects, whatever they may be. Ooh, that's really gorgeous . . . I just want to touch it! And to spin some fiber, of course. God, I really want to become a better spinner . . .